I just had a brain flash. Feats. Coveted by players, contentious among DMs. Not included in the first few incarnations of D&D, feats became an option in AD&D2, and fully integrated in 3.0. They allow more complex customization of characters than straight up classes do, but there are so many options and some characters (I’m looking at you, fighters) get SO DANG MANY! What is a “feat” then? an achievement that requires great courage, skill, or strength. So, ideally, a feat should be something extraordinary, requiring above average ability. Hmm. Granted, PCs are by definition extraordinary, but in different ways. So why should feats be handed out across the board regardless of ability except that required to become a leveled character? This is where I step in with my brain flash. Feats as described in the PHB are extra skills and abilities or bonuses that you acquire as you level up. Looking at the list, there are two varieties of feats: what I will call Learned Feats and Natural Feats. Learned feats are those things which require some practice to become good at, say Two Weapon Fighting. Natural feats are those which denote a superior skill in a certain area, such as the Athletic feat. My proposal for the modification of the feat system is twofold: First, assign “natural” feats at character creation, as they seem like the sort of abilities that one naturally possesses, and base the assignment of them on ability scores. Second, limit the number of “learned” feats on Intelligence, because as we all know, intelligence is a measure of how well and readily we learn. Hopefully that reads ok. Anyway, each of these natural feats is presented with the key ability score that drives it. For each point of modifier that a particular ability has (Like a Strength of 18 having a bonus of +4), there is a 20% chance for a character to have the natural feat at first level. The maximum number of natural feats related to a particular ability score is the bonus value (4 at 18, 3 at 16-17, etc.). If the percentage rolled for each feat indicates the character would qualify for more than the maximum allowed, determine which feats are gained randomly. Granted, the feats in the PHB are slanted towards those with a high Dex, and Str and Con are woefully underrepresented. But high scores in those abilities translate to better damage and HP, so I think it’s a decent trade-off. 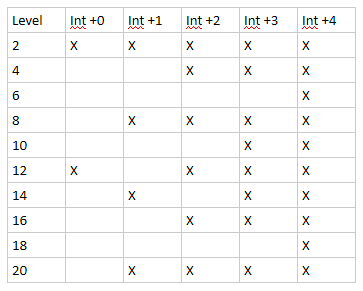 As for learned feats, instead of one at first, third, and every three levels thereafter, I propose a total number of feats equal to 1+(Int bonus x 2), evenly divided over levels 1-20. Thus, a character with a +3 bonus to Int will get the same number of feats as normal, while those with +4 Int bonus will get more. +1 and +2 bonuses will receive fewer feats, but then, they aren’t super intelligent either, so it makes sense. There’s only so much room in your brain for extra training, and if you are getting other class bonuses then it’s not a huge hinderance. This is the schedule for fighter bonus feats based on Int bonuses. (The number of bonus feats is 2+2Int if you want the formula). See? It pays to be smart. Other classes that get bonus feats I would adjust on a similar schedule, figuring a +3 bonus allowing the unmodified schedule, and lesser intelligence scores proportionately less, possibly with no Int bonus allowing at least 1 bonus feat. I’m not completely heartless, after all. Plus you got all those extra feats for being so dang dextrous, what do you have to complain about? With my previous post about character generation mentioning ability scores a couple of times, I thought I might clarify my thoughts about the generation of said scores. There are two schools of thought regarding the generation of ability scores, and I fall firmly in the camp of the Rollers. There are two reasons for this. First, I don’t believe there is anything broken about the rolling mechanic, and as the old adage goes, if it ain’t broke don’t fix it. Second, I disagree with the philosophy that spawned the point buy mechanic. One thing I really love about the world we live in is that there is so much variety. One of the things I love about D&D is the variety in challenges that can be presented, and the variety of ways those challenges may be overcome. I like variety. Variety is the spice of life. Are you getting where I’m going with this? Rolled ability scores induce a variety in characters. Good, bad, superhuman, troglodytic, it’s all there with rolled abilities. Granted, a character with generally terrible scores would be abysmal to play (and there should be a limit to how bad a PC should be allowed to be, for obvious reasons) but with 4d6 and dropping the lowest, the average says there will be a tendency towards 1 or 2 above “average” scores of 10 and 11. 10, 16, 10, 15, 16, 14. Just rolled those. Perfectly good stats. Heck, taken as rolled (Str, Dex, Con, Int, Wis, Cha) they’d make a fine cleric. 13, 13, 11, 9, 13, 8. Just rolled those, too. Total modifier bonus of +1, as rolled they’d make a passable Barbarian. Not great, but hey, variety. He might not be able to go toe-to-toe with Conan, but get a few levels on him and he’ll do just fine. That’s the thing, there. He doesn’t have to go toe-to-toe with Conan or Bloody Gar, or even Osric the Cleric. They are on the same team. And here is my second reason for being in favor of rolling over point buy: PCs are not video game characters. They don’t need to be able to beat each other down to 1 HP at the same rate, they don’t all need to fill the exact same quest requirements. PCs are part of a TEAM. D&D is a cooperative endeavor. Different members filling in the gaps that other members leave open. Fitting together as a unit and accomplishing goals together. The driving philosophy behind the point buy system is one that takes “balance” to the extreme. It says that all characters must be the same power level in the same categories, always. My rogue should be able to handle that vampire just as well as your cleric, and his barbarian has to be as able to deal with the magical dungeon of the Arch-Mage as well as her wizard. It’s not realistic, and contributes to a PvP mentality at the table. Fairness is a fallacy. The world isn’t filled with level-appropriate challenges carefully lined up for those seeking a smooth path from 1st to 20th level. The world is filled with terrifying dangers that could literally kill hundreds of people before they are destroyed. Isn’t it a trope to have a dungeon filled with the detritus and leavings of defeated adventurers from the past who foolishly bit off more than they could chew? Why not so with your party? Again, we hit on drama and tension. If every dungeon the party comes across is carefully stocked with level-appropriate monsters and traps, where is the drama? Where is the nail-biting? If the whole pack of adventurers can waltz through any dungeon while losing only their carefully calculated quarter HP, where is the risk? Where is euphoria that comes from overcoming insane odds to finally defeat that Big Baddie? The thrill that comes from rolling a 20 at the critical time? Or making the save that allows you to drag all of your unconscious buddies out of that dark hole and back to the surface? Stories aren’t told of the easily handled “challenges” that parties face. They remember the ultimate challenges, the ones where they were knocked down to -9 HP but were given 12 HP from the two potions carried by the cleric who was out of spells, allowing them to charge the beast one last time in a desperate bid to escape certain death, rolling a critical, and downing the monster, finally winning the horde of gold it was sitting on. Back to point buy then. The two main arguments I’ve heard for point buy systems is that they 1) allow DMs to control the power of their games by assigning the number of points available for buying stats, and 2) it creates an even playing field for players by removing over- and under-powered characters. Point buy allows DMs to control the power level of their games. Hrm. I have some issues with this argument. First, I will refer back up to my “if it ain’t broke…” statement above. DMs already have all the tools they need to control the power level of their games. Literally EVERY tool they have is to control the power level of the game. We control how much XP we give, how much treasure we give, what enemies they fight, how those enemies fight, what is available in the shops, resource distribution, everything. Why do we need to control the ability scores of the characters as well? Is it to take out of the hands of the players any application of creative control over their characters? It isn’t as though they have control over the dice as they roll. Merely the assignment of the generated numbers. Or is it that we want to give the illusion of control over to the players? “You can have the perfect stats, as long as you don’t spend too much.” The points instead create homogeneity in character ability scores, removing variation and individuality. Thus bringing up point 2: Point buy levels the playing field by removing over- and under-powered characters. What makes a character overpowered? A pair of 18s? Three 18s? A 17 and a 16? How often will a pair of 18s show up on rolled stats? A single 18 occurs only once in hundreds. Two? In the thousands, at least (though I’m not much of a statistician, please feel free to correct my numbers in the comments). Why take away these magical results from the lucky player who manages to roll them? These characters are special, allow them to be special. What makes a character underpowered? No stats above a 12? above 10? I have my lower limits on what abilities may be (these are PCs, after all, not someone’s mooks). A minimum of a positive total ability bonus score, and no stats below a 6. These characters, too, may become beloved, simply through their triumph over so much with so little in the way of natural ability (though certainly much more than the average peasant). How sweet is a touchdown for a running back who gets the ball every 3rd play? How much sweeter is that same touchdown for the kicker who jumps over the line in a fake field goal play? Victory can happen to anyone, but those who taste it less savor it more. It is no weak thing to have an “underpowered” character at the table, least of all for the player. One last thing I’ll touch on, but briefly, because I already talked about it above. There is no need for an even playing field between the players. This kind of thinking is directly from video game land where PvP runs rampant, battle games pair off opponents. But this is D&D we’re playing here, not Mortal Kombat. The characters do not by any means need the same stats. It’s a team game. It’s on the DM to provide suitably challenging encounters for the group, not the players to make sure they are all on the same level. So there. Did I miss anything? Are there other hidden benefits of point buy that I am missing? Drawbacks of rolling for stats? Point something compelling out that I haven’t considered and I might change my mind.